I thought I’d share a story …. one that will likely transcend time. You know those stories that begin with, “Do you remember that time….”. Perhaps my children will one day tell their children of our little adventure and miracle. If you read my blog regulary, you will know that I have a strong faith and I learned many years ago, that there is no request too big or too small for God. It was from our pastor that I learned there was no such thing as “wasting” a prayer. Thanks to his stories about his wife Sally praying for parking spots, I have also found that with a little prayer, I too can have “rock star” parking! We have taught our kids the power of a prayer and when any situation arises….we pray, trust, believe and then wait. No Gas…Are You Kidding Me? Our family made a day trip out to my Auntie Lynn’s funeral on Friday. The weather was good, the service was beautiful and the hours after spent with family were wonderful. After a full and very long day, we got back in the van to begin the 3 1/2 hour drive back to Winnipeg. We were heading out about 7:45, so knew it would be 11:15 or so before we’d get home. Tim is a night hawk, so the thought of driving back after a long day really wasn’t a big deal. Our route took us along #1 Highway, past Brandon. I’m not one to play around with the gas gauge, I will always play it safe and fill up long before the needle gets close to the big “E”. However, I was not driving and therefor not really paying attention to the gas. We got about 15 minutes past Brandon when Tim casually said, “Oh, we’ll need to stop for gas.” Tim is a born and raised city boy, used to having access to whatever he needs 24/7. I am a country girl. When and where I grew up, the stores were closed Sundays and Mondays and there was no such thing as a Convenience Store. Clearly things have changed in my home town as well, but I knew this highway well enough to know that there weren’t many gas stations along it and I would venture a guess that those that existed, closed early. So, as we tooted along on our very low tank of gas, we came to the town of Carberry. Carberry sits along the highway, but you have to exit and travel off the highway a bit of a distance (which seemed like a mile or two, especially when you’re running on fumes) to get into town. Our gas was low enough that we were already nervous about making it in to town and finding a gas station before we ran out. We found the two town gas stations, but both closed at 9 p.m. and it was now around 9:30. As were driving down the street, we saw two guys outside the town bar. We stopped and asked them how far to the closest gas station, but they weren’t much help. I’m not sure if their “bellies were already full” or what, but they were zero help and did nothing more than waste our time and gas as we sat idling while they tried to think outside the borders of their small town. One actually thought he might be able to tell us how far to the closest gas station if he had a calculator. Ugh! We moved on and went back to the first gas station, as there were a few lights on even though the sign said “closed” and it looked to be closed. Tim knocked on the door to see if anyone was inside, but no one was there. A local man pulled in the parking lot and told us we would have to go back to the highway and head to Austin (Manitoba….not Texas, thankfully!!) He said it was about 20 minutes down the highway. The man left and we prayed. We knew there was absolutely no way we had gas to get there. We had been on empty for longer than seemed possible and there was no way we could make it 20 minutes more. So, we did the only thing we could and prayed that we would make it to Austin and find an open gas station. Shay has a great sense of humour and is definitely the family clown. For months now, he has been looking for the perfect scenerio to use the tag line from Carrie Underwood’s song “Jesus Take the Wheel”. Well, you can bet you picked up on this right away and declared it “Jesus Take the Wheel!” and thankfully, he did. We got back on the highway and tried to pass the 37 km by playing games, singing and telling jokes. (Shay provided most of the entertainment.) We pulled up to the Co-op gas station just outside of Austin at 9:59 p.m. and Tim began to pump the gas. In the middle of pumping, all of the lights on the pumps went out as the station closed at 10:00 p.m. When the pump stopped, it didn’t go unnoticed that our 75 litre gas tank accepted 74.87 litres of gas before it automatically shut off. We were literally down to 1/2 cup of gas and had we been even a minute later we would have been out of luck. Thank the Lord for taking care of all of the circumstances and giving us yet another example of his faithfulness. I love watching as miracles unfold, both big and small for it is through the smaller miracles like finding a parking spot, that you build your faith and belief for those bigger situations. 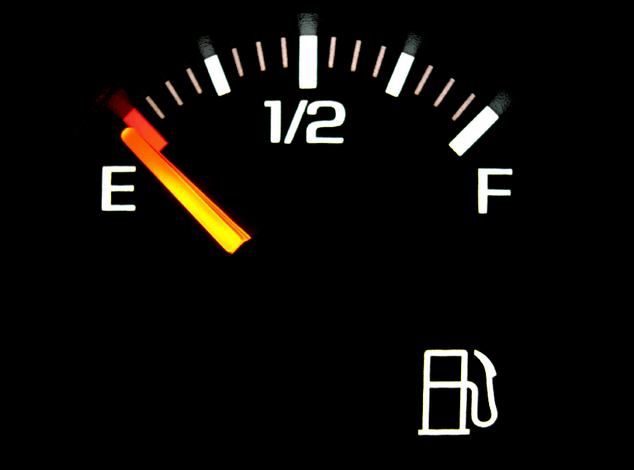 When I was looking for a gas gauge picture for the post, I found one on The Heart of Abba and pastor Ron told a “running out of gas story” as well. I loved this quote that was taken from his article. The favor of God is not even affected by our immediate circumstances… our job, our family, or even our gas gauge. The favor of God is about His goodness and His faithfulness. We receive God’s favor, not because we are good, but because HE is good. Hopefully this has inspired you. It doesn’t matter what you are going through, there is no circumstance too big or too small. Just have faith and believe. Be patient and know he is acting on your behalf. Enjoy your Sunday! Posted on June 8, 2014 by Cindy Roy •	This entry was posted in Inspirational ~ I hope!, Tales of a Not So Typical Mom and tagged faith, favor, God's favor, miracle, running out of gas. Bookmark the permalink.